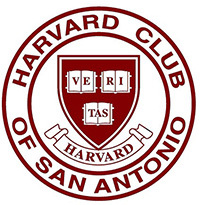 Among several benefits of the membership of Harvard Alumni Club of San Antonio, you will become connected with alumni, students, parents, and friends of Harvard in San Antonio and south-central Texas. 1. To become better connected with alumni, students, parents, and friends of Harvard in south-central Texas. 3. For financial benefits like discounts at most of our events and Global Pass discounts at nearly 200 other Harvard clubs around the world (member rates at their events). Just click here, and go to "Membership, and then to "Join"
to use a credit card. c/o Veronica Davis, Sr. Admin. Asst.